I apologise for this being later than usual but I have had a stinking toothache all week and have just found out I will be going for a root canal operation. Lucky me! I woke up later than usual for a football day and after a quick cup of tea me and the missus set out for Barking station to meet with a group of fellow Daggers. Once our little group was together we jumped onto the c2c to west ham. From west ham we got the Jubilee line to North Greenwich, as we exited the station a group of Daggers were already at the bus top. I bumped into Mick and a few others I knew and looking around I felt very comfortable surrounded by the red and blue (and green and yellow) army. The bus arrived and we all squeezed on it, that was when the singing started. This was feeling like the way I think an away day should be, a group of daggers singing and chanting into enemy territory making the bus rock with the noise! It was amusing to see the little girl in the buggy clapping along; she probably hadn't seen group singing of this calibre since her last day at playschool. The bus pulled up at our stop and we got off with song in the air. We all walked up the hill and most of the group ducked into the Charlton Liberal Club but me and MrsMetalDagger had to head up the road to find a cash machine. After ducking into a newsagents and finding a cash machine hidden amongst the biscuits we took our crisp notes back down the road into the Liberal Club. The club was nice enough £1 to get in for me, free for the missus and at £2.50 a pint of Oranjeboom I found it very reasonable. The talk in the pub was optimistic but realistic, with many expecting us to walk out with nothing. The Valley looking more packed than last time we were there! After a couple of pints we set off for the Valley, once there we bought our tickets from the little plastic booths and headed into ground. I chucked a pint of john smiths down me and then went to find a seat. 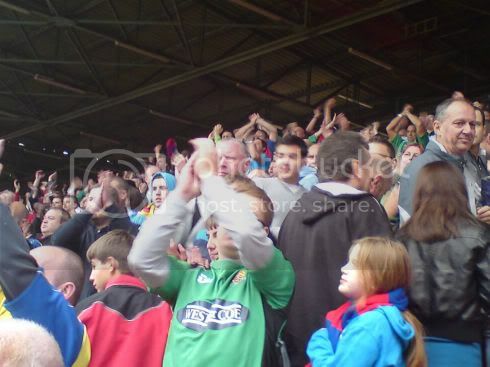 It has to be said the atmosphere was excellent and the Daggers faithful sang up a storm. As the Whistle went for the start of play I have no shame in admitting I was nervous and Charlton did nothing to help this when Lee Martin hit the bar with a rocketing shot but still we sang and still the boys in green kept their chins up. Then on 10 minutes Charlton’s threats became reality as Miguel Llera headed a Johnny Jackson corner over everyone and into the net (the same net that Danny Got himself trapped in) 1-0 to the Addicks! Slowly but surely the Greens got more into the game with Gavin Tomin with a great chance only to put it at the (pink shirted) keeper. Then in first half stoppage time we caught a break, Therry Racon clipped the leg of a leaping Bas Savage and brought him down in the box. I couldn't believe it when the ref pointed at the spot to award us the penalty. Straight away I turned around in my seat I Didn’t want to watch. In the end curiosity got the better of me and I had to look. In the end that was the right decision as I got to see Danny Green slam the ball into the bottom left corner past the outstretched keeper! 1-1 and the halftime whistle blew. I ran for a quick pee (which I desperately needed by then) then back to my seat. The feeling in the away end was if we could walk out with this result we would be more than happy. Everyone got back to their seats and the second half started. Well obviously John Still had said some magic words in the dressing room because the Daggers came out fighting and within 20 minutes the mood changed to from "glad for a point" to "looking for the win" and Charlton’s keeper Ross Worner Kept the Addicks in the game more than once, you think they'd reward him with a new strip that doesn't look like pink Bacofoil!! With about 10 minutes left we were in full song, filling the air of the Valley with a rendition of "the Great Escape" because we were about to escape a former premier league club with a point. We sang for so long that Ian next to me was complaining of arm pain from clapping and my tongue was starting to ache! Then the unthinkable happened, totally against the run of play Therry Racon put in a cross which was nodded into the net by Johnnie Jackson. Charlton had stolen a point from us in the 91st minute and the Charlton fans woke up from there perpetual silence to rub it in our faces, with little chavvy kids running down to the front of their stand to goad us and wave their fists in the "wanker" gesture. 2-1 to Charlton. The second they scored we sat down dejected for all of 5 seconds then the Great Escape started to echo again around the away end and before I knew it we were all back on our feet making the noise for our team, the team that deserved more than they were getting and we all wanted to show how much their effort meant to us. "The fourth official has announced that there will be at least four minutes of added time" well that was 4 more minutes for us to sing as far as we were concerned! Sometimes the fans lift the team, sometimes the team lift the fans but today it felt like we were one, both fans and players giving it their all for nothing more than the love of the team and the love of the game. So when Substitute Damien Scannel whipped in a cross which was met by the “Beast from Barbados” John Nurse's diving header and flew into the net to make it 2-2 we cheered like we had won a cup. it was then I noticed Nursey was face down and the physio ran over to attend to him watching the replays later it seems his diving header went right through to meet the keepers legs (lucky really, I thought he'd hit the post!). 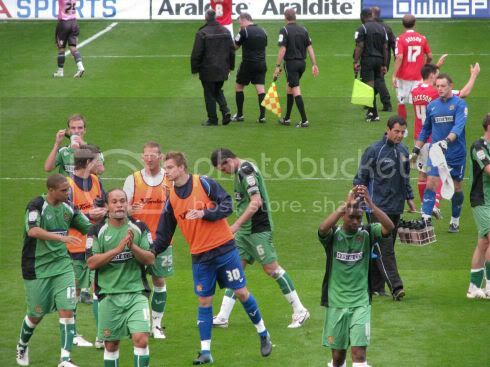 So clapping and cheering we ran down to the front of the stand, the Charlton fans that had been so keen to rub our faces in the dirt for losing to "the mighty Charlton" seemed to have disappeared and we were left to celebrate as the final whistle blew. As the team came over we gave them a standing ovation and sung their praises (and I bumped into Walesdagger, nice bloke). It was another one of those rare football moments that you could have lived in forever. 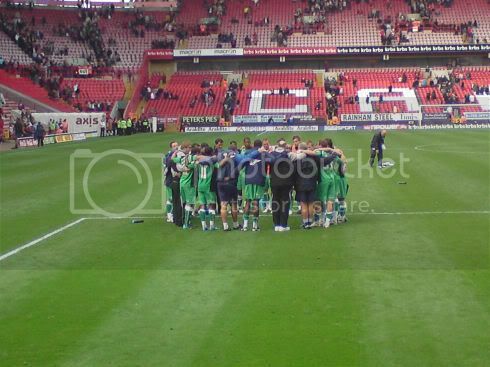 We left the ground singing "Point at the Valley, we got a point at the valley!" It's here I’d like to mention that if you watched any of the highlights on wither the BBC or the DaggersPLAYER you would have never known how well we played in the second half because they all cut straight from the Green penalty to Charlton’s 2nd goal. I know we only have a small fan base but it would be nice to see some of the nice play that kept Charlton on the back foot for 45 minutes given the spotlight it deserves! Once outside and not ready to go home yet we walked back to the Liberal Club but found out that away fans are not allowed in after games so we headed back down the road to the Antigallican for a pint. There was a great buzz in the air and everyone I spoke to was upbeat about the result with many saying we should have won, but none disappointed we hadn't. With beers drunk a group of us set off for the bus home, as we waited the team coach drove past and we gave them a much deserved cheer. Our bus came and we started singing like we had on the way there, then the bus driver turned off the engine and told us that if we didn't behave we'd have to get off!! Bloody killjoy must have been a Charlton fan! So with a bus of dagger sniggering like school kids the bus set off for north Greenwich. As soon as we reached our destination we sang as loud as we could, marching off of the bus and onto the jubilee line. The train was the same, songs were sung, banter was thrown and a good time was had by all. 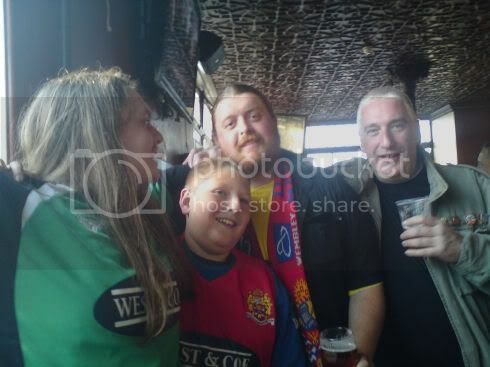 Our original small group got off at West Ham and popped into the offie for beers cheese olives and a lemon (don’t ask!) we sat on the bench outside with our tinnys as the adrenaline finally left our bodies. After a couple of drinks the c2c back to Barking was looking very welcoming and while Ian and the others headed for another pub, my stomach needed to be taken home for food. 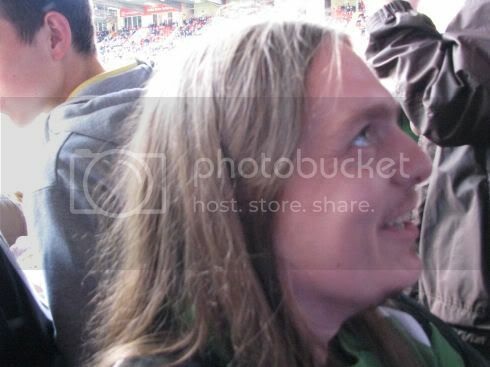 Once in I had a GoGo special and fell asleep before the Football league show could show our goals. What and awesome day, for me the very definition of a good away day. So I’ll bid you all farewell, first points on the road in the bag! DIGGER DAGGER DIGGER DAGGER OI OI OI!! Great read as allways, keep up the great work. Singing we've got 3 points, haven't you? !